If you&apos;ve ever driven down Main Street in Four Oaks, you&apos;ve probably noticed the flower beds on the corner of Main and Railroad streets. Even as the weather changes, they greet travelers with a splash of yellow, orange and purple. You may have even seen a man, studiously trimming the plants are the cars or trains buzz past. It may look like Tommy Naylor&apos;s full-time job, but it isn&apos;t.
When he isn&apos;t in the flower beds, he&apos;s at Northlake Christmas Trees and Nursery near Meadow. It&apos;s his family business, started by him and his father in 1981. 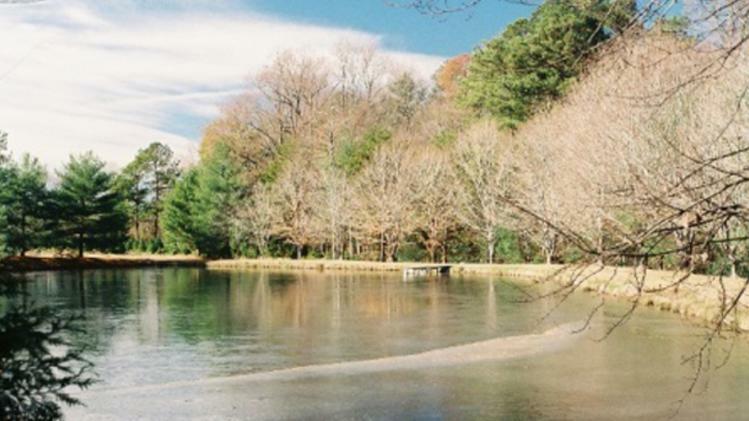 What started with a few trees planted near a scenic pond on the property now spans nearly five acres of White Pines, Scotch Pines, Norway Spruces, Leyland Cypress, Arizona “Blue Ice” Cypress and a few other varieties of spruce and firs to choose from. “My father actually got this thing going for me,” he said. “And I don&apos;t know where he got the idea from. He retired from Fort Bragg in 1979, and in 1980 and 81, those were some bad economic times. I was out of work a lot, and it was a way of him trying to get something going for me. The first batch was mostly White Pine, Virginia Pine and Red Cedar, but he quickly learned that he would have to adjust his plans on the fly. 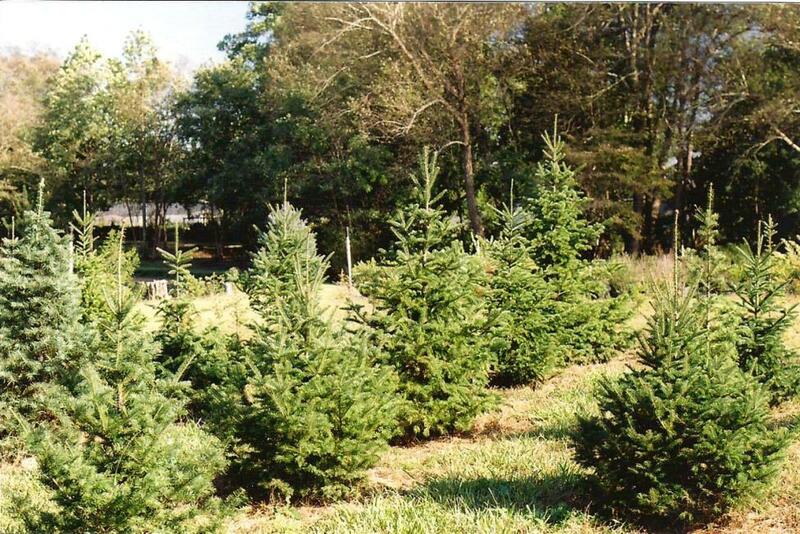 Of course, Fraser Firs are the tree of choice for most North Carolinians, and Naylor always has a full supply once he opens for business on Black Friday. On the Monday before Thanksgiving, he takes a trailer to the farmers market in Raleigh and buys a load of Frasers from a farm near Sparta in Alleghany County. He brings them back and processes them, which includes cutting an inch off the bottom and grabbing some wreath material from the bottom branches. Then, the trees are placed on the edge of the pond, with the bottom in the water. When he moves them up front for opening day, they&apos;re in water then, too. “The whole time they&apos;re in my possession, they&apos;re drinking water,” he said. It&apos;s tough to grow Frasers in Johnston County, thanks to the climate, soil and the threat of root rot. But that hasn&apos;t stopped Naylor from coming up with alternatives. He grows Canaan Firs, which are native to West Virginia&apos;s Canaan Valley. Unless you&apos;re a Christmas tree expert or, like Naylor, have a degree in Horticulture, it can be tough to distinguish a Canaan from a Fraser. A recent visitor to his farm discovered the “Blue Ice” Cypress, named for its lighter color. It&apos;s a striking tree to look at, but it also boasts an amazing scent that would surely fill up an entire house with Christmas cheer. 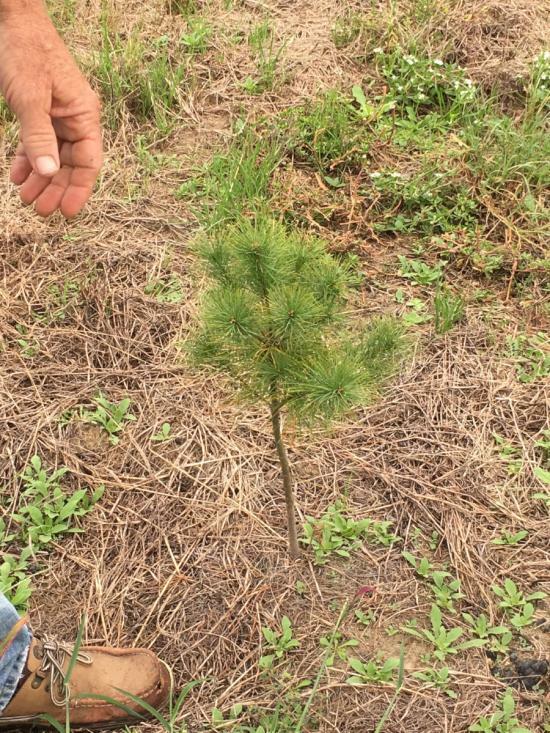 There are also firs from Korea and Turkey growing in what is sort of an experimental field, which is not exactly what you would expect to find growing in Johnston County soil. 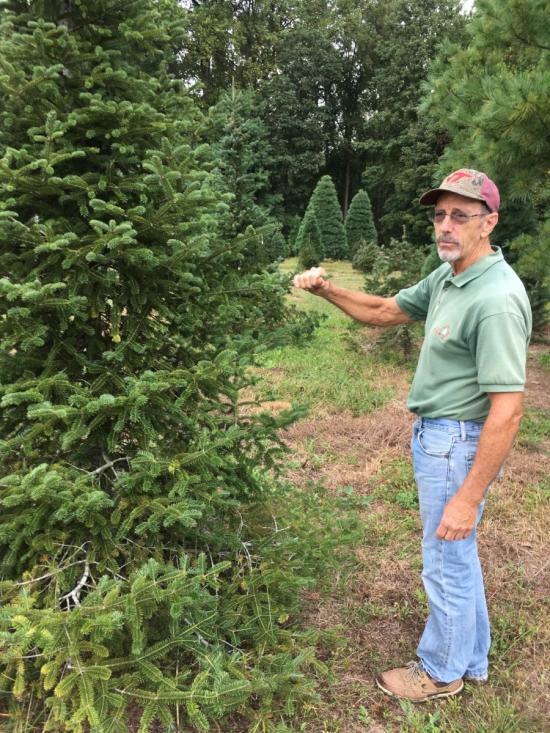 He&apos;s a member of the North Carolina Christmas Tree Association, but since that organization is more focused on the Fraser Firs, he&apos;s more heavily involved with the Virginia Christmas Tree Growers Association, where he serves as a board member. The Virginia Tech hat and the VCTGA polo shirt he sometimes wears are good indicators of that, too. It was through that association that he met champion wreath maker Sue Huffman. She was a double grand champion in 2007 at national event in Des Moines, and taught a popular class on wreath making at the annual meetings. After picking up some pointers, Naylor won a blue ribbon for his wreath made of Canaan Fir greenery in 2008, and then was named grand champion for an undecorated wreath in 2009. That earned him the honor of making a wreath for governor Mike Easley&apos;s office door later that year. He doesn&apos;t enter many competitions these days, but he still makes about 50 wreaths a year with greenery from his trees out on the farm. Much like his wreath customers, his Christmas tree shoppers tend to return to the farm year after year. “I have repeat customers and they know what they&apos;re looking for and they know what they want each year,” he said. While many of Naylor&apos;s clients are experienced natural tree shoppers, he also caters to those who are used to “fake” trees. • Get it after Thanksgiving. • Always keep water in the stand. Newly-cut trees will consume a gallon of water a day the first week. • Keep it away from heat sources, like fireplaces, heaters and vents. These tips help keep the tree green for the season, which is not only more attractive, but far less likely to be flammable — as anyone whose ever tried to burn green pine needles will know. A six-foot White Pine will run you about $36 with firs and spruces costing a little more. So, it&apos;s not a big blow to the wallet, either. 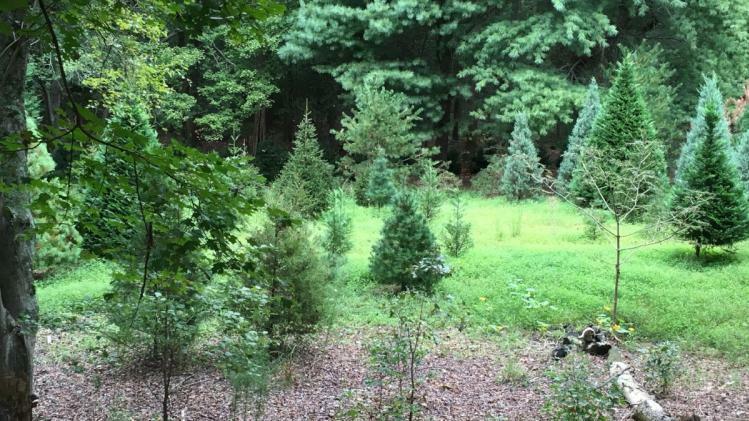 That&apos;s one of the reasons that, despite getting 18 inches of rain on his farm during Hurricane Matthew last year, Northlake Christmas Trees & Nursery had its best year ever. Some of his trees have root balls that weigh 300 pounds, which makes for a tough work. Things like that, and the rising average age of growers, have him concerned for the future of the industry. “A lot of the owners have passed away or are in bad health, and the families are choosing not to continue the operation any more,” he said. “And that&apos;s leaving me here at the juncture of 95 and 40 in an enviable position. A line of White Pines that was part of the original planting back in 1981 has now grown to become shade trees on the edge of a field on the back side of the pond. It was at this spot, easily the most picturesque on the property where Naylor told his visitor about why he enjoys his job so much. Opening day for Northlake Christmas Trees & Nursery is Friday, Nov. 24. For more information, call 919-894-3524. *You can find this article in it&apos;s original published form in this month&apos;s issue of Johnston Now magazine, by clicking here. Randy Capps is the publisher of Johnston Now magazine. He's worked for daily newspapers in Shelby, Henderson and Fayetteville and is a graduate of Gardner-Webb University. He lives in Four Oaks with his wife, Shanna, and son, Ethan. Visit the Johnston Now website here - johnstonnow.com or Like them on Facebook here - facebook.com/johnstonnow.